Your first birthday party was a hit! You got a lot of compliments on your outfit, and Mommy may have earned a few points for creativity. The Mickey Mouse Clubhouse was full of fun and laughter, and all your little friends came out to be a part of it. 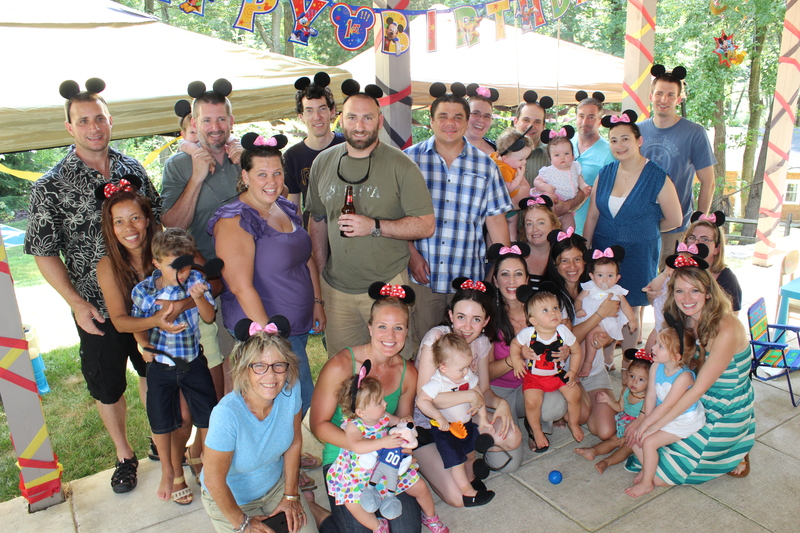 We decked the yard with play things, adorned your guests with mouse ears, and enjoyed celebrating your first year of life on a beautiful summer day. Among the most popular of activities were the water table and the parachute, but by far the winner or this popularity contest was the ball pit! Your birthday menu consisted of some fun Mickey-approved treats (The Mickey Mellons were worth the extra time put in at 2:00 a.m. the night before)! You did a great job on your smash cake! At the end of the day, we all had a wonderful time. It will definitely be a day that will live in my memory, even if you are too young for it to! A very special THANK YOU to my dear friend, Erin, for traveling all this way from Kansas City to help make this day possible! We love you, Anthony Joseph. Happy 1st Year from your fan club!